Breakfast is the most important meal of the day. A good breakfast can set you up for the rest of the day, filling you up nicely until lunchtime. People who skip breakfast can find themselves tired and sluggish by mid-morning and some studies even show skippingbreakfast can make people more prone to putting on weight. But there is a difference between eating something for breakfast and eating a healthy breakfast. Eating something at breakfast time is better than eating nothing but if you really want to be healthy then you should opt for a healthy breakfast - unfortunately that means fry-ups are out! 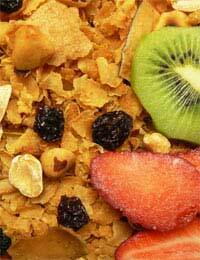 Granola is a great breakfast to have. It is nutritious and healthy and is hearty enough to keep hunger pains at bay until lunchtime. It is far more tempting to graze on unhealthy snacks mid-morning if you have not had a hearty breakfast to keep you going. Thisdelicious granola recipe is simple to make and 100% gluten free so even with your allergy you can enjoy as much of it as you like! It is the perfect breakfast for summer or winter and is also ideal for a mid-afternoon or evening snack. Make a batch and storeit until you want it. To begin, preheat the oven to 150 degrees C gas mark 2. Add the honey, sunflower oil and gluten free vanilla flavouring to a pan and bring to the boil. Add a dash of salt to the boiling mixture. Stir the mixture then take the pan of the heat. Set the mixture aside to give it time to cool. In the mean time take a large bowl and add to it the rice flakes, coconut, sunflower seeds, sesame seeds, flax seeds, buckwheat flakes and pumpkin seeds. Using your hands (obviously after you have cleaned them!) combine all the dry ingredients together. Now take a baking pan and add the dry mixture to it. Once the honey mixture is cooled pour it over the dry mixture. Using a wooden spoon stir everything together so the flakes and seeds are coated in the honey mixture. Now place the baking pan in the oven and bake for half an hour. Once cooking time is up remove the pan from the over and leave it to cool for about 20 minutes. Once cool add the dried fruit and raisins to the mix. You can always add different dried fruits to suit your taste. Store the granola in an airtight container. For breakfast just add milk. A hearty breakfast is the best way to start the day and be at your best. This gluten free granola certainly does the job and will keep you full until lunchtime!